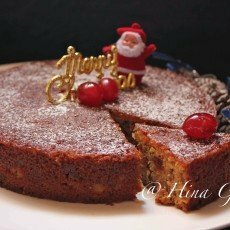 I can’t believe it’s almost end of the year and finally, I am baking the most awaited cake of the year, the traditional Christmas Cake, which is one of my favorite cakes from my childhood days but I baked this for the first time and it is simply decadent. I soaked my fruits in rum sometime in November, thanks to Toscano for the fruit mixing event and that was a great reminder to soak fruits for the cake, usually fruits are soaked in rum or brandy but this year I soaked them in trio of rum, beer and red wine and credit for this idea again goes to Toscano. Now coming to the choice of fruits, please feel free to add in whatever nuts and candied fruits your family loves – candied peels and cherries, dates, nuts, colored tutti fruity but remember there is no Christmas Cake without all these gems. This year Santa (me) gifted some really nice baking serve ware, it seems Santa bumped onto some good GOSF deals but I was worried whether I will be able to inaugurate new serve ware with Christmas Cake and surprisingly while I was making caramelized sugar, door bell rang and I received my Christmas Gift, that moment I felt like giving courier boy a big hug for having such a perfect timing but I controlled my emotions and just say thanks with a big 1000 watt smile on my face. Christmas fruit cake requires caramelized sugar, it adds dark color and deep flavor to the cake but caramelizing sugar to perfection is an art which I learned after successfully spoiling two batches, no, technically one batch because the second one I converted into salted caramel sauce. Don’t be like me and worry about it, it’s really not that hard, you just need to be careful while doing it and you cannot leave the kitchen until it is done, so no phone calls and no multitasking, stay focused else you will not realize and the sugar will be burnt.This recipe is my friend Maya, who is originally from Kerala but now in Bangalore for many years, I always rely on her for the recipes which I don’t have because her recipes turn out perfect in one shot as her recipes are tried and tested over the years by her and if I am stuck somewhere she is just a phone call away. Like me, Maya has a passion for cooking and food and now she caters also but only to the bunch of selected clients, her menu ranges from the Mediterranean to Asian to European, she is my Wikipedia of recipes. I baked the cake at night so that I can escape ringing phone and doorbell but sadly I couldn’t but anyhow I managed to throw my cake in the oven while juggling between the kitchen and the phone calls. Next day when I thought now I can peacefully click the pictures and have entire house to myself, “He” decided to work from home and Momo was in a bad mood, so again I was running in the whole house with camera in one hand and keeping Momo away from cute little Santa, whom he desperately wanted to gulp. 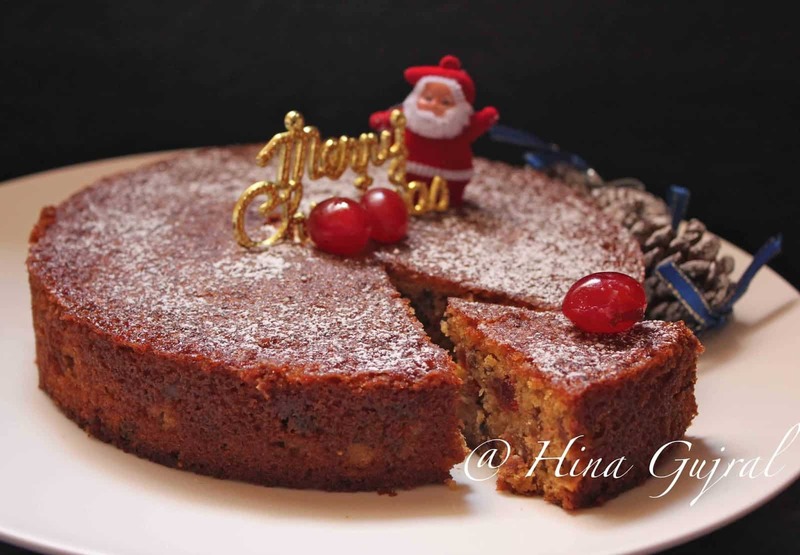 Traditional Christmas Cake loaded with the goodness of rum soaked dry fruit and nuts. Learn how to make the best Christmas cake in a few simple steps. For soaking fruits, mix all the candied fruits in a bowl and pour in rum and, wine along with garam masala. Mix nicely with fingers and transfer to clean airtight container. This can be done one - two months before or you can either do it one-two night before making the cake. Caramelize sugar before starting the cake and set it aside to cool down. In a pan on low heat, melt sugar slowly. It will first melt and then turn into a dark brown goop. Keep stirring and let it turn a deep dark caramel color. Don’t let it burn. Keep the flame on low, add about 1/4 cup water and stay away because there will bubble and roar like a volcano eruption. The sugar will harden and form crystals. Slowly heat the mixture until the sugar crystals dissolve and keep stirring it. This will take around 10 mins. Let this cool and set aside. Do not worry about the consistency it will be like thick honey or molasses. Line a round baking tin with parchment paper and grease sides well with butter. Sift the flour, baking powder, garam masala powder, and salt in a bowl. Add soaked dry fruits and mix nicely until all coated well. Beat the butter and sugar until fluffy and pale in color – about 10 mins by hand, 3-4 mins with a hand mixer. Add rum essence, vanilla essence and mix until combined. Add egg one at a time, beating each time for about 1 – 2 minutes using a hand mixer. Fold in the flour mixture one-third at a time and mix gently using a spatula. combine all the ingredients nicely to form a smooth cake batter. Add the cooled caramel gently fold in. Pour cake batter into the greased cake tin. Tap once or twice on the kitchen counter to release any air trapped. Bake for 50-55 mins until the top turns into a dark brown color and when a skewer inserted into the cake comes out with dry crumbs. You can start checking from 45 mins but usually, in our oven, it takes up to 55 mins. The top will look like it’s overdone but don’t worry, make sure the inside is also completely cooked. Once the cake cools down completely, brush it with some leftover rum and cover it with foil and leave it in the oven or some warm place overnight or until you need it. This way it has a nice matured flavor. Dust the Christmas cake with the icing sugar before serving. Store Christmas cake at room temperature for up to a month in an air-tight container. Unnhhh… Hina you are too good at killing me like this 😉 What a tempting dish. I wish instead of Bengaluru you were at Pune… I would emerge magically 🙂 Missed it.